First things first: Bogart’s Books & Café in Millville hosts LOTS of open mics. 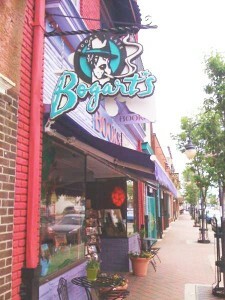 They host lots of events that they keep posted on their Bogart’s Books & Café – Events page. They are located on 210 North High Street, Millville, 08332. Every third Sunday, Bogart’s is the home to Poetry on High, hosted by Rita Lyman. There are singers, songwriters, and poets, contrary to what the title might have you believe. The people are interesting and some of their usual performers are very different. If it’s your first time, check out the bookstore. Used bookstores are fun because you don’t know exactly what you’ll find. Looking directly into the store, you’ll see that the left hand side is fiction, and the right hand side is non-fiction. You can also bring in your used books for credit in the store. But enough about all that. You come in and sign the sheet like any other open mic. When you get called up, you play or read. On any given show there’s about 2 poets for every 1 singer/songwriter. Around 3:30 there is a 10 minute intermission. Relax! Then around 3:30 the featured artist performs for 30 minutes. They pick the featured artists the month before by random draw. Rita encourages artists to promote themselves, and this is definitely a cool place to do it! After the featured artist, the rest of the list is finished and anyone who wants to perform again gets their chance. At 5pm the shop closes up and everyone goes home a little better than they were before. This entry was posted on April 22, 2009, 1:58 pm and is filed under Reviews of Open Mics. You can follow any responses to this entry through RSS 2.0. You can leave a response, or trackback from your own site.